We seem to be having an abundance of strawberries which are being imported from USA because it's summer time there. Sometimes if I'm lucky I'm able to get really sweet berries. Otherwise they are usually half ripen. With so much strawberries on sale now, this makes me want to search out recipes using this fruit. I thus decided to try out a mousse which seems relatively easy. And I must say that it was not only easy, it was delicious as well! The mousse had a slight tartness to it and was extremely smooth with each bite. 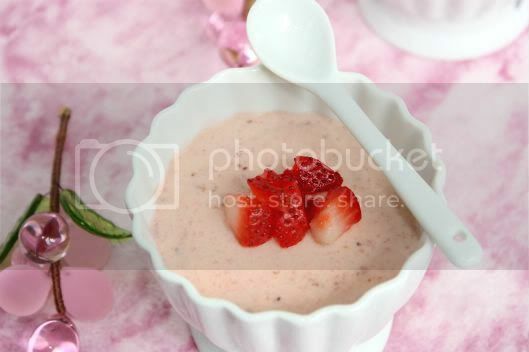 You can also opt to serve the mousse with some whipped cream, fresh cut strawberries or a strawberry sauce. 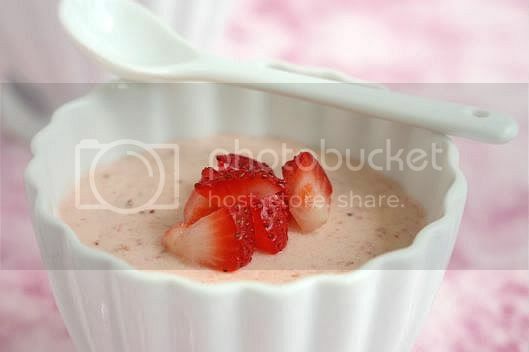 1) Prepare the strawberry mousse: sprinkle the gelatin over the water in a small bowl and set aside to bloom (soften). 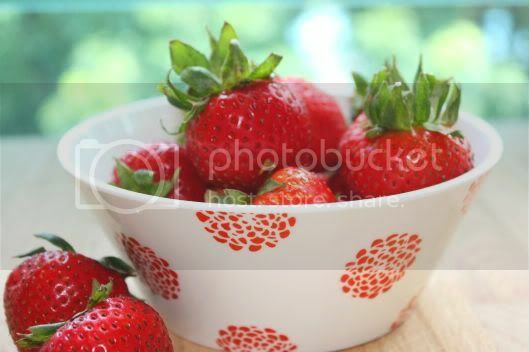 2) In a medium saucepan set over medium heat, stir together the strawberries and sugar just until hot. 3) Add the gelatin and stir until it is completely melted. Let cool to room temperature. 4) In the meantime, whip the heavy cream to soft peaks. Once the strawberries are at the right temperature, carefully fold the whipped cream into the fruit base. 5) Pour into serving bowls and chill for at least 4 hours or overnight. !!!!! The whole entry is simply delicious! The chinaware brings the mousse to a star level! Absolutely classic! The presentation and photo are really great. The dessert alone was guaranteed to be delish, but this is fantastic. 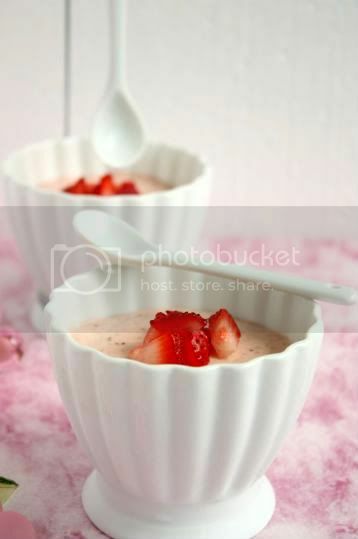 Whoaaaaa... those strawberry mousse looks so beautiful! Oh it looks delightful! I want some! This indeed is a lovely dessert. They look even more pretty in those ceramic bowl set. Btw i wonder how you are holding the spoon in your third click?? That looks gorgeous! I love your dishes and photos, too. Hi everyone and many thanks for dropping by. Rosa, actually I didn't get these from Ikea as the Singapore outlet don't sell such ramikins. Ramya, haha unfortunately I'm not that great. The ramikin actually has a hanging hook for the spoon which will dangle above it. I thought it was pretty neat thus bought these to add to my collection. just realized that in the recipe, you dont mention when you put in the zest and lemon juice?